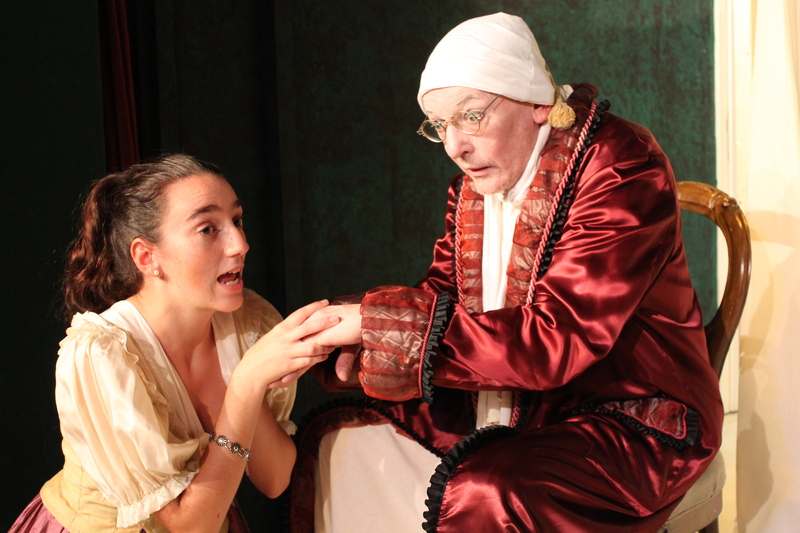 Review: La Malade Imaginaire by Theater Die Kaeuze at Lace Market Theatre Nottingham. – East Midlands Theatre. 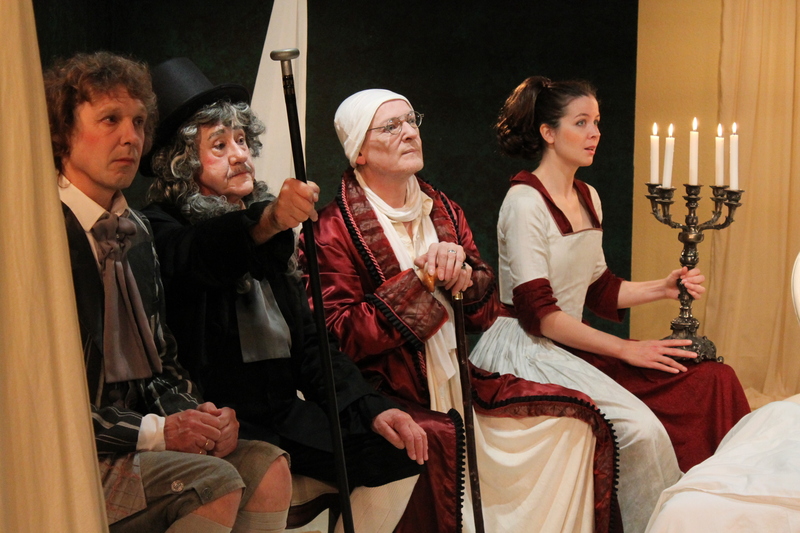 La Malade Imaginaire was Molière’s last play in decades of prolific writing and performance. As well as a being one the finest French playwrights, Molière also trained in acting and in particular the art of comedy. So it is especially interesting and somewhat ironic that he died very shortly after performing the lead role as Argan in his own play La Malade Imaginaire. Having suffering a desperate attack of coughing and haemorrhaging during the play Molière insisted on finishing his performance. Later he suffered a further haemorrhage and died a few hours later without receiving the last rites. 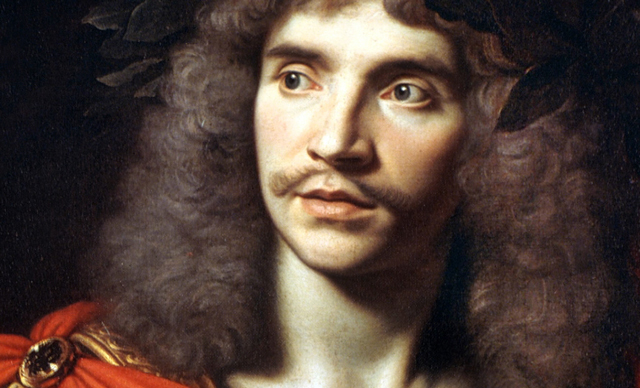 A theatre superstition that the colour green brings bad luck to actors is said to have come from the fact that Molière was wearing green at the time of his death. This fateful time the malady was not at all imaginary. 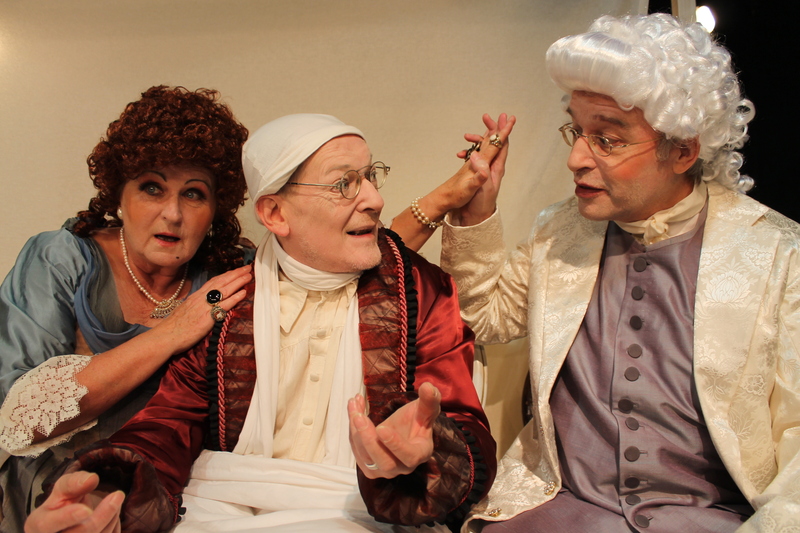 It takes no imagination to realise the popularity of this, one Molière’s best loved plays. In its time, performances of it even had large ballet sequences to give some grace and beauty to a play about a less than beautiful personality (Argan) who is basically a walking – moaning – groaning – severe hypochondriac. At the time it was created it was a three act comedy-ballet. 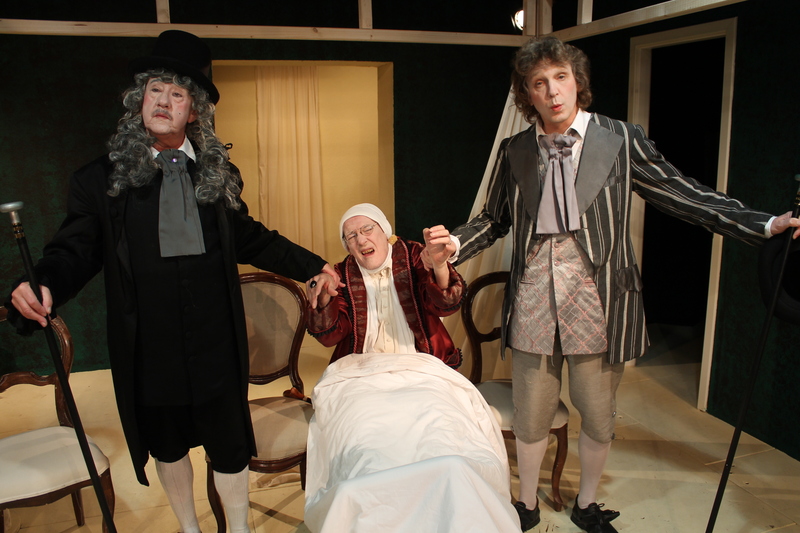 Molière’s own hatred of doctors infuses the work with great wit at the expense of his own 17th Century world of medicine. The thinly plotted play uses true love and subterfuge, obsession, cunning, broad comedy and revenge as its underlying themes. Some of its story lines appear incomplete to a contemporary audience but this does not deflect from the core moral messages of the play. La Malade Imaginaire has been translated into many languages including German and The Lace Market Theatre are the host for the Karlsruhe based Theater Die Käuze who are performing the play in German as part of a theatre twinning event that takes place every four years. Two amateur German groups are involved and this year’s visit also includes performances from the Jakobus Theater who will perform a comedy Auf und Davon or Birds on The Wing by Peter Yeldam. So the prelude aside; how does a German language play by a Frenchman translate to the English stage at The Lace Market Theatre Nottingham? Pretty well actually. In this matinee performance the audience has a good amount of German language speakers who can enjoy the complexities and wit of Molière’s script and the English speaking part have the benefit of surtitles which come in the form of summaries. The La Malade Imaginaire set comprises of three solid frames onto which are hung large creamy white plain bed cloths which are inventively interchangeable providing new vistas of the same environment. This styling gives the more than heightened playing style – in gorgeous period costumes – an authenticity boarding on peeking like voyeurs into the past goings on. The superbly applied 17th Century facial make-up on most characters also helps in this regard. Visually it is most enjoyable with some subtle lighting changes. 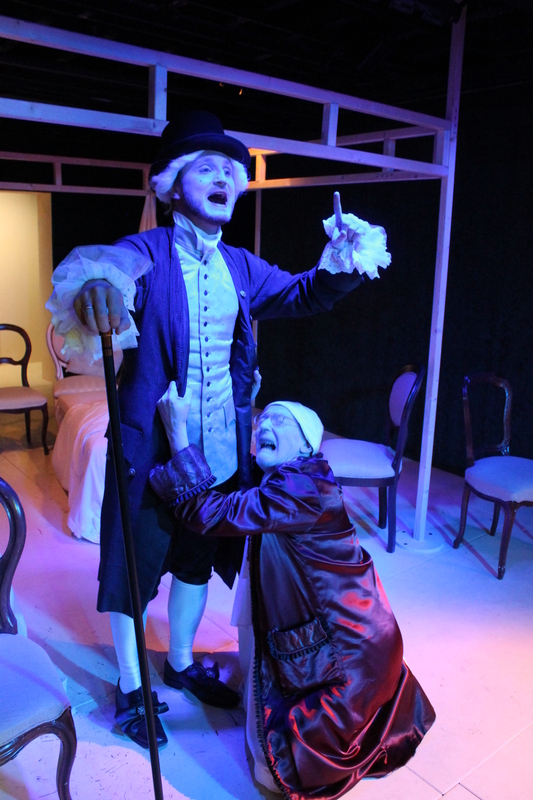 Director Marie-Rose Russi brings out the best in the comedy which at times slides into the edges of parody; something that this reviewer is sure that the tempestuous Molière himself would have had strong opinions about. From an enthusiastic ensemble of twelve Theater Die Käuze players we appreciate the mannered and stylised approach to this performance. As the central player Henric Bewerunge amuses and irritates as the rascally hypochondriac Argan who constantly whines and cajoles about his supposed illnesses and tries to control the love affairs of others whilst his own wife Beline (Sabine Kaufmann) has an affair right in front of his dripping nose. Other stand out performances come from Lena Golis and Elena Andreou as Argan’s put upon daughters Angelique and Louison. Wolfgang Schum and Martin Klecker make a fine comedy double act and Norbert Wingender is period perfect as the larger than life pharmacist Monsieur Fleurant. The role of Toinette (Larissa Kaufmann) is amusing with a subtle hint of irony in her body language and facial expressions. Dennis Golis’ menacing Doctor Purgon is a dramatic highlight of the show. Lars Sðrenson gives his lovelorn character Cleante a pallid whimsical feel of male romantic embodiment of the 17th Century. It is comical how Louison would fall for someone so apparently wan and drippy. Then that is the beauty of Molière’s cleverly inventive imaginings and how we die laughing at the follies of his age and see their reflections in our own. 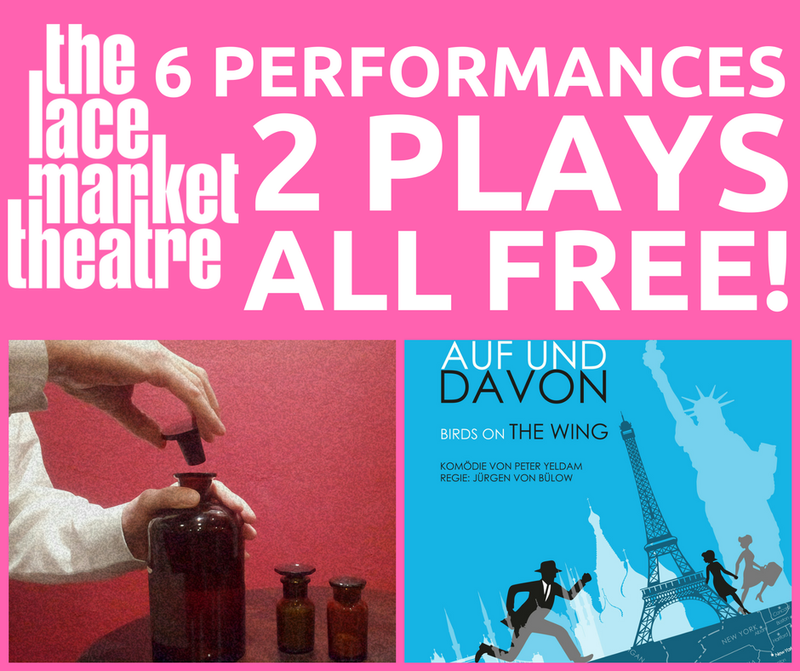 Auf und Davon runs at The Lace Market Theatre 28-29 March 2018. All performances are free but booking is highly advised as they often sell out.